Really makes you want to go there, doesn't it? Yikes! 112 F is pretty darn hot. You don't hear much about it anymore, but for years Presidio routinely was the hottest spot in the nation...frequently surpassing even Death Valley (where I have experienced 126 degrees and it is brutal). My father, used to tell me that he Presidio had the hottest temperatures in the nation, and that was more than 50 years ago. Now adays, with the global climate change, this could be much worse. 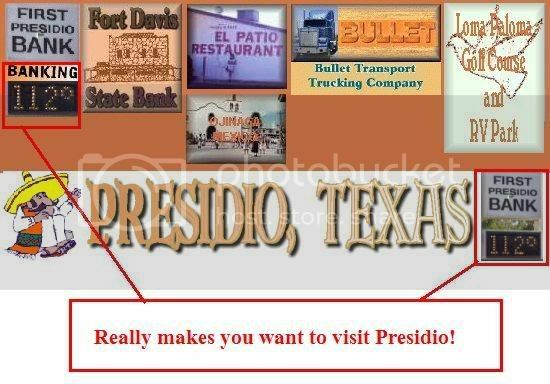 "presidio, hot spot of the southwest". there was a sign that said that on the outskirts of town back in the seventies....yea it is hot, but it's a dry heat. ha ha. Presidio did not have themselves removed. However, the Band Director keeps the weather info and he was not home for the 5 pm call from the NPS. The Presidio monthly recap sheet would be sent in and they normallly show a degree or two higher than Lajitas. The Lajitas Trading Post kept the weather records and river readings since 1899 to 1998. Owned the LTP from 1992 to 1998. In 1998, the new owner did not want to continue with the weather and the the Barton Warnock Center (BBRSP) has been the weather station since 1998. Sometimes Lajitas would be the highest in TX with Marfa being the lowest, usually from Feb to April. Marfa is maybe 80 air miles from Lajitas. Presidio gets hot, yes...but 112 with a 10 mile breeze only feels like...oh wait...still 112. "Rub al-Khali covers about a third of the peninsula, most of it belongs to Saudi Arabia, while the south of United Arab Emirates, the west of Oman and northwest of Yemen also belong to it. Rub al-Khali has no permanent settlements, but Bedouin tribes like the al-Murrah, live nomadic lives in its outskirts. Rub al-Khali represents one of the most extreme areas in the world with summer temperatures shifting from below 0?C at night to over 60?C at noon. Dunes can reach heights of more than 300 metres."